← Austin Gives Recognizes Zuma Office Supply As Finalist in GeneroCity Awards! The entire month of April is Earth Month, and today April 22 is Earth Day. Zuma has found 50 Ways to Help the Planet which are common sense, easy-to-do changes to your lifestyle that really have a positive effect on our environment. We are committed to being kind to our planet and protecting the environment, so we often promote recycled office supplies and “green” office products to our customers. The ubiquitous Recycling Triangle says to “Reduce, Reuse and Recycle”. Today many people do a good job on the Reduce and Recycle part of the triangle. It’s Reusing all that material that’s being recycled where people often fall short. That is where buying products made from recycled material comes in – to help reuse the waste that is being recycled. But enough about our encouragment to “buy recycled”. For Earth Day, we thought we would share our Top 10 Ways to Help the Planet. To see the full list click 50 Ways to Help the Planet. If all the households in the United States changed from hot-hot cycle to warm-cold, we would save the energy comparable to 100,000 barrels of oil a day. Also, only was clothes when you have a full load. If you stop letting the water run while brusing your teeth, you’ll conserve up to five gallons of water per day. The U.S. daily savings alone could add up to 1.5 billion gallons–more water than by the people in New York City. Consider the amount of pollution created to get your food from the farm to your table. 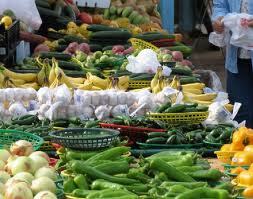 Whenever possible, buy from local farmers and farmers’ markets. This supports your local economy, and reducing the amount of greenhouse gas created when products are flown or trucked in. Be healthy, keep it local, and help the planet by shopping at local farmers’ markets. You paid for those extra features on your car, so put them to work! Your vehicle can get up to 15% better mileage when using cruise control. Considering today’s high gas prices, this is a boon not only for the environment but for your pocketbook as well. Before you throw something away, think if someone can use it. One man’s trash is another man’s treasure. Either donate to a charitable organization or post it on a web site designed to connect people and things, such as Freecycle.org. Freecycle.org is a really cool organization that keeps 500 tons a day out of landfills, and gives a way stuff to people in need! Some banks will even pay you a dollar or donate money to charity when you cancel the monthly paper bank statements you get in the mail. If every home took advantage of online bank statements, the money saved would send more than seventeen thousand recent high school graduates to a public university for one year. Stop rinsing dishes before using the dishwasher, and save up to 20 gallons of water each load. Also, you’re saving energy used to heat the additional water used when rinsing. #3 – AVOID PLASTIC BAGS – TAKE YOUR OWN TO THE STORE! Each year the United States alone uses an incredible 84 billion plastic bags. They are not biodegradable, and are making their way into our oceans, and subsequently, the food chain. Stronger, reusable bags are an inexpensive option that saves energy, reduces waste and helps the food chain. Adjust your thermostat one degree colder in the winter and one degree warmer in the summer. Each degree less will save up to 10% on your energy use! Also, invest in a programmable thermostat which allows you to regulate temperature based on when you’re away from home. It pays for itself in no time. Nearly 90% of plastic water bottles are not recycled. Instead they go to landfills and take thousands of years to decompose. Buy a reusable container and fill it with tap water, a great choice for the environment, your wallet, and possibly your health. The EPA’s standards for tap water are more stringent than the FDA’s standards for bottled water. And the savings in energy to make plastic bottles and transport them to the store really makes a difference. Maybe the most important tip is to SHARE! Take what you’ve learned, and pass the knowledge on to others. If every person you know could take one small step toward being greener, the collective effort could be phenomenal. That includes buying recycled office supplies when available, and recycling in your office and in your home. Zuma Office Supplies can help! We have thousands of recycled and green office products, we have a free ink and toner recycling program, and we can answer questions on how you can start recycling in your office today! Happy Earth Month to all, and let’s make every day Earth Day! This entry was posted in Recycling and Green Products and tagged earth day, earth month, green office products, Recycled Office Supplies, top 10 ways to be green. Bookmark the permalink.